Many weight loss plans -- carbohydrate cycling, ketogenic diets, liquid diets -- can be complicated, so a diet of bread and water alone may seem attractive due to its simplicity. While such a diet may produce weight loss due to a low calorie content, there are many potential side effects, as a bread and water diet would not provide balanced nutrition. Consult a doctor and apply your own common sense before you start any diet plan. The foods you eat not only have an effect on your weight, but the functioning of your body's internal systems, including your endocrine system, which controls hormone production. Bread contains very little fat and tends to be rich in fiber, so a diet comprised entirely of bread and water could have negative effects on your hormone levels. According to research published in the December 1996 issue of "The American Journal of Clinical Nutrition", consuming a diet rich in fiber and low in fat can decrease levels of testosterone. This hormone helps produce muscle and can aid in fat loss. 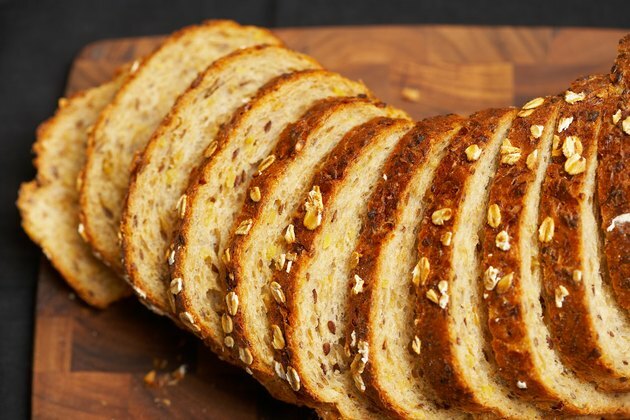 Although bread does provide some important nutrients, it is typically devoid of vitamin C. This nutrient acts as an antioxidant and is crucial for healthy growth and development. Additionally, vitamin C plays a vital role in the wound healing process, so a bread and water diet may compromise your body's ability to heal injuries. Consuming a diet consisting of just water and bread can also impair your vision. This is because neither water nor bread provide vitamin A. This vitamin is important for a wide array of functions, including maintaining the lining of your eyes that keeps out harmful bacteria. You may also experience night blindness, as a lack of vitamin A can dry out your eyes and cause damage to your cornea and retina. Consuming just bread and water may make you more susceptible to infections. This is because both vitamins A and C -- vitamins not provided by bread -- are involved in maintaining the integrity of your immune system. Even relatively innocuous infections may become serious health problems due to your compromised ability to fight off infections. Eating a diet of just bread and water can be detrimental for your skeletal system. This is because vitamin C helps produce collagen, which forms part of your bone structure. Additionally, bread contains no vitamin D, and low levels of this vitamin may lead to osteoporosis. Neither bread nor water are rich in dietary fat. While dietary fat is sometimes avoided on diets because it is high in calories, doing so can be detrimental. Your body needs fat to maintain your skin and hair health, so a diet low in fat can be detrimental for both.